I'm hoping you can tell that the gem in the tiara is pink! It was orignally clear, but I coloured it with an alcohol-based marker. FYI: I don't buy coloured gems often: I have a huge stash of clear ones and colour them as required to coordinate with my projects. Right, I've got even more cards to make with a whole rush of family birthdays coming up (including my own soon....guess I don't have to make a card for that one though; I've not had any requests yet!) so it's a good job I can grab more time this week to get inky and have fun in the process. Hope you all manage to squeeze in some inky therapy time too! So much fabulousness I can barely stand it. 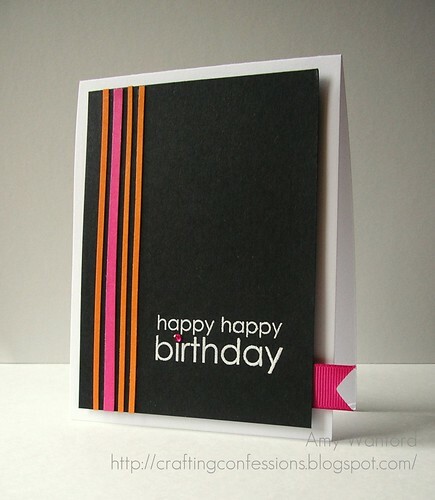 1. your princess card is too perfect and 2.how striking is your black number - LOVE the touch of the sticky out ribbon. Did I mention what an AMAZING friend you are! Thank you SO much my sweet for the most feltyliscious and perfect purse (Honestly I have had to have it near me to at all times to stroke) unfortunately the chocky didn't stand a chance and was gratefully snaffled last night - super yum! Loving both cards Aimes, but the second one is pushing my buttons! Love the balance and dramatic pops of colour. THUD!! Did you hear me fall in the studio? Oh, my Aimes, you have outdone yourself...the first card is "diva" sweet, but the second one? Pure Genius!! I'm expecting to see this as the winner for sure! Everything about it is perfect...design heaven :) hugs!! Fantastic, Aimes! 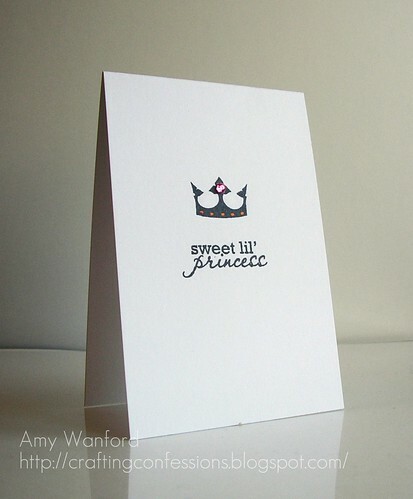 Love the classy little princess card. And card #2 is just stunning--such a beautiful design & great use of colors! They are both so awesome! Love the bold pops of color with the black. Very cool cards! soooo very fab girlie...woot woot for long weekends! Oh my goodness girl...I love those stripes on your second one...you rocked the color challenge...and I never use black as my background. Thanks for even more awesome inspiration! Fabulous tip with the gems Aimes, I'll have to remember that one! Oh wow, love these CAS look! AMAZING CAS cards Aimes! Love the pop of pink on the first (I buy clear gems and color them too - instant customization :)). The second is so gorgeous too - love the graphic look with the stripes. I was thinking, it would look amazing with melon berry stripes too *wink* :) Pinning this card to Pinterest for sure!